1. I only picked from brands that have an established record of sales and support. I would hate to recommend a product only to see a company discontinue support for it next week. This is a real danger with smart home products since the industry is so new. There are a lot of startups that come and go and also a lot of products being released that are seriously incomplete. 2. All of the smart thermostats considered in this article are what I call standalone smart thermostats. These smart thermostats can function fully without any other smart home accessories. They communicate wirelessly using WIFI and come with their own app. They don’t require any special home automation hub or subscription service. If you don’t think you need the extra app or maybe you already have a smart home hub with its own app, you can find smart thermostats for much cheaper by considering a Z Wave thermostat. 3. The thermostats in this review are low-voltage (24V) thermostats. Thermostats in general can be classified as either high-voltage or low-voltage. Low-voltage thermostats require 24V power and high-voltage thermostats require 110V or 220V power. They are NOT interchangeable. If you try to hook up a 24V thermostat to 110V, you will most likely destroy it. Most residential HVAC systems will require a low-voltage thermostat. Some examples include: forced air furnace and AC, heat pumps, and boilers. Systems that typically require a high-voltage thermostat are electric resistance heaters such as baseboard heaters or radiant floor heaters. I consider high-voltage thermostats to be a different product class so they are not considered in this review. 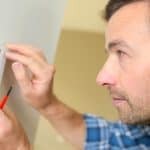 However, if high-voltage (also called line-voltage) smart thermostats are what you’re looking for, have a look at this article to help you get started. Make sure you know what type of HVAC system you have so that you can confirm it will be compatible with the smart thermostat you buy. I guarantee you’ll be thoroughly annoyed if you pull your old thermostat off the wall and find that your shiny new smart thermostat doesn’t have enough terminals to accommodate all your system’s wires. In particular, you have to make sure the thermostat you buy supports enough stages to accommodate your system. Not long ago, if you had a forced air system, you could be pretty sure you had a single-stage system. Today, many newer systems, especially in larger houses, are multi-stage systems. Also, heat pumps are becoming increasingly popular. Heat pump systems come in quite a variety too, including multi-stage heat/cool and even multi-stage auxiliary heat. Also, if you have any extra equipment such as a whole home humidifier/dehumidifier or a ventilator (ERV, HRV) you’ll want to make sure your thermostat can support that as well. Most of the top smart thermostats on the market include one accessory slot which is specifically intended for this type of equipment. However, I haven’t found any that include more than one. Compared to older thermostats, smart thermostats use a lot of power. 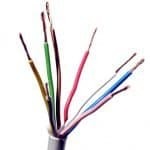 The c-wire (common wire) is an extra wire that allows the power sucking smart thermostat to get power without interfering with the operation of your HVAC system. Even if a manufacturer advertises “no c-wire required”, I recommend making sure you have one anyway for optimal performance. Without one, it means the thermostat will either be powered by batteries or by using a technique known as “power stealing”. Neither option is ideal. For a much more detailed explanation of the c-wire situation click here. A great smart home product should be able to work together with other smart home products. What sorts of integrations are possible with a smart thermostat? Ideally a smart thermostat keeps your home at the temperature you want all the time without you ever having to think about it. However, in those instances when you need it just a little cooler or warmer, you want a temperature adjustment to be as easy as snapping your fingers. Voice control is the way to achieve this. You won’t have to find a remote or get up and walk to the thermostat or wait 10 seconds to load the app on your smartphone. Instead, you’ll just have to remember the voice command. -Devices that can help decide when to turn ventilation on or off such as smoke alarms and air quality monitors. -Devices with motion sensors such as cameras and some lights. This can help the thermostat decide whether you are home or away. -Devices that can work with a smart thermostat to improve your home’s energy efficiency like ceiling fans and smart vents. When buying a smart thermostat (or any smart product) you should have an idea of big your smart home is going to get. That way you can plan ahead and your smart thermostat will fit in nicely with the rest of your gadgets. Here are the most significant smart features that you’ll want to be aware of when purchasing a smart thermostat. You can save the largest amount of energy by simply shutting off your equipment when you’re not home. Therefore, the most important energy saving feature of a smart thermostat is its smart home/away feature. What does it do? The thermostat’s job is to automatically figure out when you’re home and when you’re not and then adjust your setpoints accordingly. How does it work? 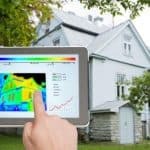 Typically, you’ll set desired temperatures for when someone is home and then you’ll have different energy saving setpoints for when the house is empty. There are three common methods for determining whether you’re home or not: manual scheduling, motion sensing, and geofencing. No single method is perfect, so the best system is a combination of all three. Getting out of bed in the morning is hard enough without a wintery blast of cold air as you try get out of bed and face the day. Perhaps a smart thermostat could help with this problem? What does it do? The thermostat will estimate how long it will take to heat or cool your home to your desired setpoint. When this option is enabled, the smart thermostat will start your equipment ahead of time so that your home reaches the setpoint by the time the schedule switches. This feature is of particular importance for homes with heat pump systems. Unlike fossil fuel burning furnaces, heat pumps tend to require long run times to move the temperature dial in your home. In order to avoid using expensive auxiliary heat, the thermostat has to know when to turn on the heat pump after a long, cold night. How does it work? Thermostats can calculate how long it will take to heat or cool your house based on outdoor temperature, past performance, type of HVAC equipment, and size of home. The old way of programming a thermostat meant manually inputting a schedule to follow. Schedule learning takes the place of that process. What does it do? It takes the place of having a rigidly programmed schedule. If you feel too warm or cool you adjust the thermostat. It records your adjustments and after a few days of “training” it will “learn” your preferences. How does it work? Each time you adjust the thermostat, the time and temperature you adjust it to gets plugged in to an algorithm. The algorithm combines a few assumptions about most people’s comfort level with your input and uses that to manage your home’s temperature. Often times a thermostat is located in an area of the house that tends to be warmer or cooler than the rest of your house. Smart thermostats give you the option to add additional sensors throughout your home. The additional sensors can then report back to the thermostat with the “correct” temperature reading. Using the new readings, the thermostat can adjust to keep you more comfortable. Also, some smart thermostats rely on motion sensors to determine if your home is occupied so it can optimize your heating and cooling. Additional motion sensors throughout your home can give the thermostat a more accurate picture of whether someone is home or not. Some manufacturers sell dedicated external sensors (learn all about ecobee’s sensors here). Others have chosen to integrate closely with other smart home devices and use sensor data extracted from those devices. Smart thermostats collect a wealth of information about your home environment. Wouldn’t it be cool if you could somehow turn all that data into something useful? Well, you can, and that’s exactly what some smart thermostat manufacturers have done. You can use these reports to analyze your usage, see how much energy you may have saved, and possibly find ways to save even more. The quality of usage reports between different manufacturers varies widely. Some don’t have any reports and others have full-color graphs showing months of data. Don’t buy a smart thermostat without checking with your power company first. Many power companies offer rebates for customers that buy smart thermostats. I have started compiling a list of available rebates right here, but it’s by no means complete. I recommend checking with your electric company and gas company if you have both. Most will have any available rebates listed on their website. However, for some smaller energy companies you may have to give them a call. 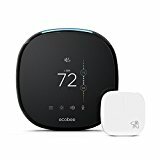 See On Amazonecobee4 Alexa-Enabled Thermostat With Sensor ecobee4 offers a great experience for the average user and has enough extras to satisfy the power user. The ecobee4 is our pick for the best overall smart thermostat. It doesn’t have the schedule learning capabilities of the Nest, but it does have remote sensors and a built-in Alexa speaker. It also has great in-depth usage reports and full access to many custom settings. And, at roughly the same price as the Nest, we feel that those few extras are enough to make the ecobee4 the better choice for most people. Most people would agree that the Nest and Ecobee4 are the top two smart thermostats available. If you’d like to dig a little deeper on how they stack up against each other, check out my detailed comparison of the two. The ecobee4 is compatible with the 3 major voice assistants, Alexa, HomeKit, and Google Home. Not only does the ecobee4 work with Alexa, it actually has an Alexa speaker embedded within the thermostat. It’s also supported by many other major smart home brands. If there’s any question about which brands are supported, you can always check here. It has external sensors that you can place strategically throughout your home. This is especially good for larger houses that may not heat (or cool) evenly. The sensors send occupancy and temperature data to the thermostat. It uses that data to keep the spaces you actually use at the temperature you want. The dedicated external sensors and the features that come with them are unique to ecobee’s thermostats. It has the best energy reports we’ve seen. You get monthly reports that compare your energy usage to other nearby ecobee owners. You can see minute by minute graphs of all motion and temperature data recorded on both the thermostat and its external sensors. The graphs will even show when a smart feature like smart home/away or smart recovery has taken place. All the information and graphs are accessible from the web console inside the Home IQ tab. If you’re one the many people that hates it when technology tries to tell you it knows better than you, the ecobee4 may be for you. Unlike many other smart thermostats, it has a full set of customizable options. For most people the default settings will work just fine, but for advanced users and tinkerers, there’s plenty of options to tweak. There are so many options that it can sometimes be difficult to find what you’re looking for. You can access the thermostat’s controls from the mobile app, the web console, or the thermostat itself. But, each device has a different menu with certain settings available only on certain devices. The ecobee’s geofencing is not as advanced as the Nest’s. It only allows one active smartphone to participate in the geofence. If you want more than one person to be part of the geofencing, you’ll have to use a third-party service like IFTTT. Although this does work (see my tutorial here), it’s a bit of an extra hassle to set up and it’s definitely not as nice as a fully integrated system like Nest has. What’s The Difference Between The Different ecobee Models? Ecobee currently sells three models that are relatively similar. They all use the same software so you can expect top level smart home control from all three. I’ll explain the differences for you here in just a couple sentences. The ecobee4 has everything ecobee3 has plus it has an integrated Amazon Alexa speaker along with a nice blue light on top. So basically to make an ecobee4, you take an ecobee3, smoosh it together with an Echo Dot, and add a blue light to the top. It lacks an accessory hookup. That means you won’t be able to control anything beyond your furnace and A/C, so no whole home humidifiers, dehumidifiers, or air handlers. The retail package doesn’t come with any additional sensors (both the ecobee3 and ecobee4 come with one). However, it is compatible with the sensors if you wish to purchase them separately. The Nest’s sleek looks and easy to use interface make this model a top seller. The Nest thermostat is a really nice looking and well built product. It’s easy to use and generally just works. Once it’s installed there’s almost no programming required. Feel cold? Turn the dial up. Feel hot. Turn it down. After a few adjustments the thermostat will learn where you feel most comfortable and automatically adjust. Simple. However, Nest’s ease of use comes at a bit of a price. Generally, if you want a product to be easy to use, you need to give up some control. Nest is no different. If you anticipate being the person that plugs it in and just wants it to work, the Nest is the best choice. But, if you prefer maximum access and control of every option, the ecobee4 may be a better choice for you. Most people that use the Nest report that it’s super easy to use. The learning feature means you’ll rarely have to make any changes other than simply adjusting the temperature up or down. In case you do need to make some changes, generation 3 has a bigger screen than previous versions resulting in easier to navigate menus. Many popular smart home products work directly with Nest (they don’t require any hub). If there’s ever any question whether something will work with your Nest thermostat, just look for the “Works with Nest” logo. 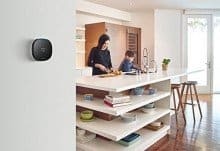 Integrations include popular Nest brand products such as Nest Protect and Nest Cam as well as other brands such as Haiku fans and August locks. The Nest thermostat looks sharp. It glows blue or orange when cooling and heating respectively. If you have any visitors it will probably spark a conversation. Nest has fully integrated geofencing with multiple accounts. That means if you have multiple phones in your home, it won’t go to away mode until all connected phones are outside the geofence. All it takes is for each phone owner to create a Nest account (don’t worry, it’s free) and connect to the thermostat. Despite it’s Apple-esque appearance, Nest doesn’t play nice with Apple products. It supports just about everything else, but it doesn’t support Apple HomeKit. The Nest lacks external sensors. Therefore, any temperature measurement will come from your Nest thermostat itself. Hopefully, your thermostat location is in a place that is representative of your whole house. 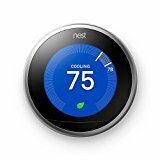 Nearly all the great Nest features with a more subtle appearance and a more budget friendly price. 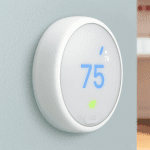 When we move down to the mid-range smart thermostats, the same two companies show up with models that are nearly as useful as the top range models. The main difference is that they don’t have support for some of the more complicated HVAC systems. So, unless you have an HVAC system that is only compatible with the top range models, you may be better off saving a little money and choosing one of these mid-range models instead. Both the ecobee3 Lite and the Nest E have almost all the same smart features as their more expensive counterparts. The ecobee3 Lite model loses its Alexa speaker and extra sensor (both included with the ecobee4) whereas the Nest E loses almost nothing. For that reason, we believe that the Nest E is a slightly better value than the ecobee3 Lite in the mid-range. However, which one is best for you depends on whether you prefer ease of use (Nest E) or complete control (ecobee3 Lite). The Nest E looks quite a bit different than the flagship Nest model. The frosted display can’t really be seen from all the way across the room but that’s not really it’s intention. Instead of the flashy “look at me” style of the more expensive Nest, the Nest E is meant to blend in. It only has 6 terminals rather than 10 like big Nest. That means some multi-stage equipment won’t work and there’s no room for accessories. Instead of being compatible with 95% of home systems, it’s only compatible with 85%. Everything else is the same. You get the same great schedule learning and geofencing features as well as all the Works with Nest integrations. Has all the necessary tools to extract the majority of possible smart thermostat savings without the high initial cost of a premium unit. The most important money saving feature of a smart thermostat is its ability to know whether you’re home or away. So, if low cost is your number one concern, you really only need a smart thermostat to do that well. The best way to do smart home/away is to combine a preset schedule with robust geofencing. That’s precisely what the Lyric T5 does. Back when Honeywell first came out with their Lyric Round, they had a number of problems with their geofencing feature. Since then, they have made the necessary updates to turn it from a liability to an asset. The T5 has the best geofencing among the economy smart thermostats. It’s built right into their app and supports multiple users. 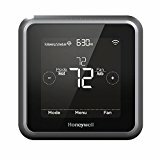 Although it doesn’t have the broad compatibility of the top smart thermostats, it does support Amazon Alexa, Apple Homekit, and IFTTT.